it appears that your protein remains mostly at the origin. this makes sense since bsa has a molecular weight of 67kDa, too large to significantly migrate through a 15% acrylamide gel. when i asked you about knowing if your hydrolysis was effective, i was not asking if you lysed the cells. hydrolysis of the protein will break it into smaller fragments which should migrate through the gel. since most of the protein remains near the origin, the protein was probably not sufficiently hydrolyzed to present strong bands upon staining. i also asked for the acryl/bis ratio of your gel. 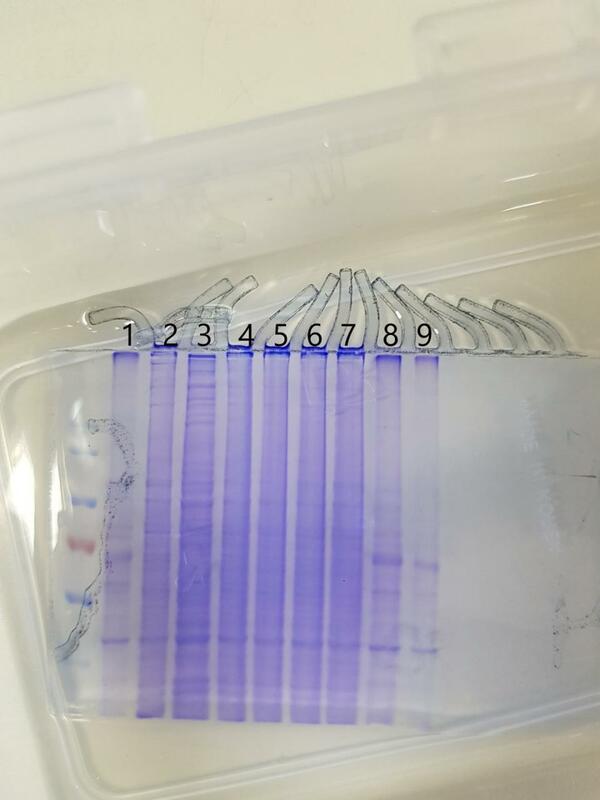 protein page is usually 29:1 or 37.5:1, nucleic acid page is usually 19:1.
also, it appears that you don't have sufficient stacking gel. rule of thumb on stacking is minimum 0.5cm for mingles and 1cm for standard gels or you won't see proper stacking of the proteins. Please somebody could help me TT. I prepared 10% SDS solution (100 ml) by adding 10 g SDS in 80 ml distilled water. I mixed by stirrer for 3 hours, the solution looks very clear for me and the I made up the volume untill 100 ml. I tried to adjust the pH to 7.2 but the pH was not stable. Could someone have any suggestion? My pH machine is new and no problem with other solution. Did I make a mistake in making SDS? don?t adjust the pH of the sds solution. The sds will precipitate in the junction plug of the electrode. we never bother to adjust the sds. if you really need to, then just suspend it in buffer. or use pH paper to get near the desired pH. thank you mdfwnko for your comment. becaus now I am working on SDS-PAGE technique having 15% acrylamide concentration for hydrolysed BSA pretein. 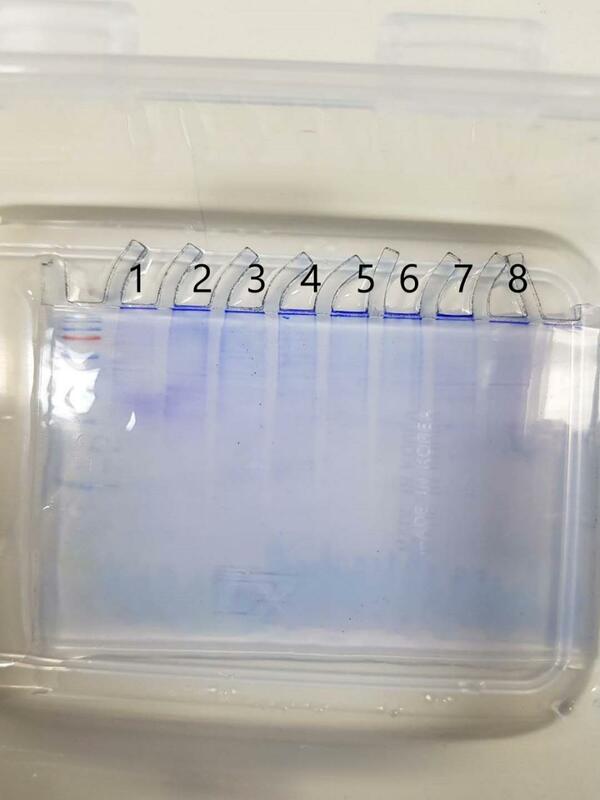 some one in my lab said I have too small amount protein going through the gel and look like my protein stayed in the well and not all going down. I used 30 microgram protein normally I should have a lot of protein in the gel. PS. my protein of interest is 15 kDa. I repeated 2 time but the result is still the same. 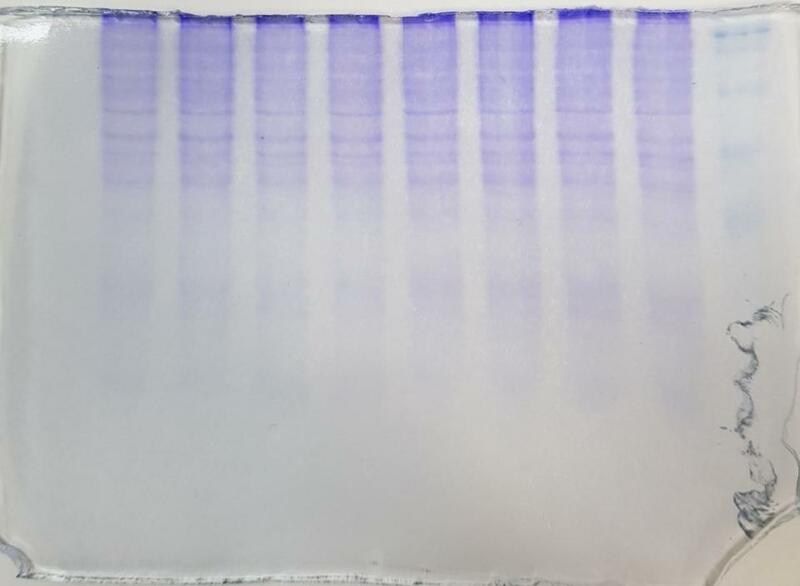 Here’s another idea that might help with diagnosis of the problem: if your lab mates (in your own lab or another one) are running the same kind of gels with their own protein preps, and they are having success, see if you can do a little trading: borrow some of their protein and loading buffer and run it on one of your gels along with some of your own proteins. Then see if they can run some of your proteins/loading buffer on one of their gels along with their proteins. This should help clarify whether it is a sample problem or a gel problem. If your proteins run well on their gels and their proteins do not run correctly on yours, then your gels are the problem. If the opposite is true then the problem is most likely the sample- either the protein prep or the loading buffer you are using. Then compare notes and see where the differences are likely to be. are you sure that the protein has been successfully hydrolyzed? are you sure you prepared the buffers properly? how far did the tracking dye travel through the gel? what was the color of the sample after the sample buffer was added? is that a size standard on the right? Dear Oldcloner Thank you for your suggestion. I did try the use my protein extraction with my lab mates buffer (it is a comercial buffer) and the results looked similar to mine so I assumed that my protein have a problem. my sample is Hacat cell, I did not count the cell for protein extraction I just cultured them in the 60 mm dish and harvest it and did the protein extraction. I would try as your suggestion using my sample with my lab mate's gel and my gel with my lab's protein and let's see the results. Dear mdfenko thank you so much for your question? I followed the protein lysis buffer product extraction protocol, I used bradford protein assay. How to know if my protein has been succesffuly hydrolyzed? gel component is 15% gel (H2O 2.3 ml; 30% acrylamide mix 5 ml; 1.5 Tris (pH 8.8) 2.5 ml; 10% SDS 0.1 ml; 10% ammonium persulfate 0.1 ml; TEMED 0.004 ml) and 5% stacking gel. running condition is 60V for 30 min and then 100V for 90 min. on the right is the standard size (protein marker) I use 2 microlite. please give me any suggestion if I do something wrong. I would try as OldCloner suggest first. No. 1, 2, 8, 9 is my lab mates' sample ( No. 1 is 10 microg, No. 2: 20 microgram; No. 3 is 30 microgram. I suspect that I did not well extract my protein. Or Hacat cell is difficult to lysis? how can I get high protein from Hacat cell? Edited by Vui, 21 November 2018 - 07:34 PM.